SAMCA was an Italian automotive manufacturer based in Parma with operations in 1947. 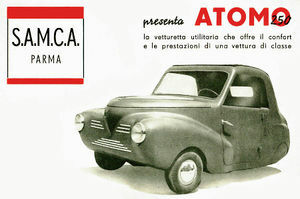 In 1947 they presented a three-wheeled automobile at the Milan Auto Show under the designation Atomo. The drive was a 246 cc 2-cylinder engine and should have seen a maximum speed of 75 km/h. But the vehicle ended not selling very well.